Built to designs by Carlo Gatteschi in 1854, the Teatro Signorelli has hosted major cultural and theatrical events for over a century now. 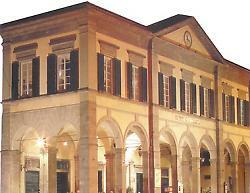 The theatre belongs to the Accademia degli Arditi, in Piazza Signorelli, and is neo-classical in style. The theatre now functions also as a cinema, conference centre and bar.